Who knows what caused the earth to move last Satuday morning? Somewhere in the sea bed, for some untold reason, due to some unforeseen cause, there was a release of energy. Such was the power of that fount of energy that it travelled through a fault line on the sea bed and through land traversing four countries. Dhaka in Bangaladesh, New Delhi in India and Lahore in Pakistan but it was high in the Himalyan Kingdom of Nepal that the energy located itself. An epicentre that forever changed the lives of a land and its landscape. In metaphysics, the Bindu or dot is considered the point at which creation begins. An energy deposit which can in turn radiate energy. In tantric iconography, a Bindu is thought to be as Shiva; all of creation and destruction. In Buddhism, a Bindu is the falling of the drop. 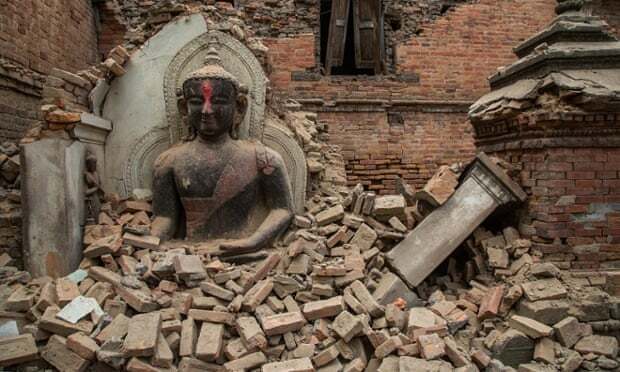 And on April 25th it seemed iconography, philosophy and a malevolent force of destruction fell as a 7.9 magnitude drop some 55 kms off Kathmandu. I was just about finishing my preparations for a long sabbatical from everything. As part of that exercise, I had deactivated my TV and the internet at home. I had gone into my office late in the morning to finish checking in online when the news of an earthquake in Delhi flashed on Facebook and Twitter. I dismissed it as the usual tendency to hyperbole so prevalent in the lexicon of social media. We do not smile: we Lol or Rofl. We do not cry, we Col. Until I saw that devastation had happened elsewhere. The falling of the drop had made the earth quake in Kathmandu. Like a roller-coaster ride that had gone horribly wrong in an amusement park, one of the most sought-after destinations of the world was no more. Snow avalanched down the slopes of Mount Everest. Buildings fell. Temples and towers lay in ruins. People were buried under rubble or swept away. And Kathmandu and its surrounding areas that the world flocked to – climbers, dope heads, families on vacation, loners seeking salvation, the philosopher and the pervert, the religious and the rambunctious, the monk and the hippie – saw a deathly stilling. The world is rushing to assist with rescue efforts. And amidst all the suffering, the sordidity of a nation that is ranked 54th in worst of 81 counties on the Global Hunger Index comes to the fore. Take this: Nepal apart from filling the brothels in India and other parts of South Asia is also home to a baby factory. There are reports of Israel sending incubators to help transfer to safety about 24 babies born in the past few days to surrogate mothers in Nepal to Israeli parents. I trawl the Internet to read more. The body count is rising by the minute. The stories of the dead and the injured are making the rounds. The list of the devastation caused is soaring. I take a deep breath and ask myself why? We humans have contributed to all the natural disasters with our selfish plundering of the earth and with our callous disregard for the environment. But this time we are probably as much as the culprits as the drop that fell. And it occurs to me that the people of Nepal are paying the price for the human greed for satiation. Overpopulation has strained the carrying capacity of the Middle hills especially in the Kathmandu valley. With the depletion of forest cover for crops, fuel and fodder, erosion has lead to flooding. Our quest for Nirvana, be it through mountaineering or marijuana or make-believe has made us seek destinations that are not equipped to handle surging human inhabitation. We capitalise on a poor economy to make it ours to fulfil our shallow needs. We exploit nature because we think we can. The quiet of the mountains throbs with incessant chatter and the clang of the cash register. We take a mountain kingdom and transform it into rubble just as if we had buried sticks of dynamite five feet apart through its length and breadth. In many ways with our disregard for nature and eco-systems, we caused the drop to fall. And it is a collective guilt that we must acknowledge and seek to make amends. For this is merely a warning of what awaits us. It would do well to remember that the earth is not ours to do with as we please. We are all only passing through.